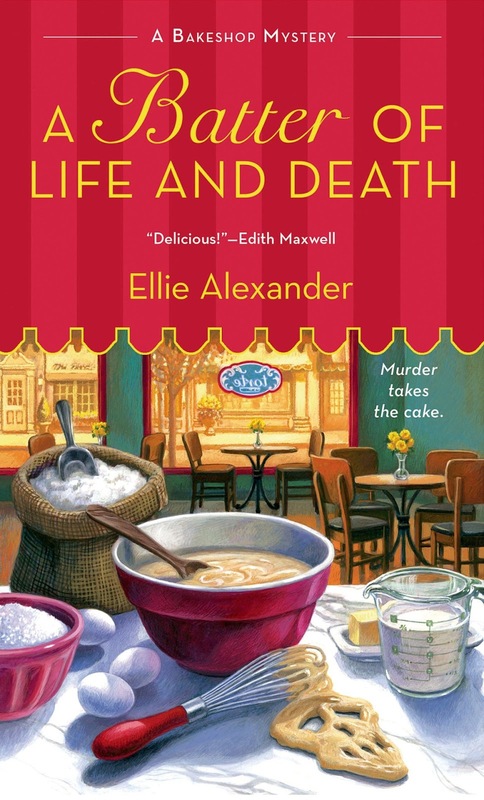 A Batter of Life and Death, a cozy culinary mystery, is the second book in the Bakeshop Mystery series by Ellie Alexander. [FYI — Book 3, On Thin Icing, will be released on December 29, 2015, and is now available for pre-order on Amazon and Barnes & Noble.] 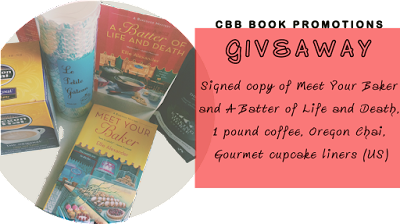 I reviewed the first book in the series, Meet Your Baker, here. 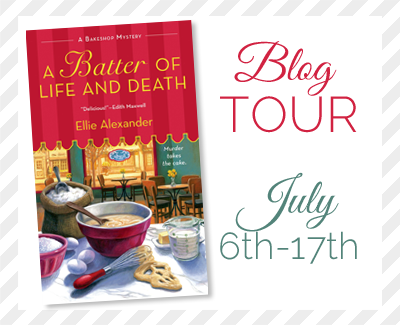 A Batter of Life and Death by Ellie Alexander is a really good, really fun read! I couldn't put it down, and finished A Batter of Life and Death in one day! Jules, her mother Helen, and the other employees — Andy, Sterling, and Stephanie — are all returning in this novel, for more baking and pastry adventures in Torte. Ashland townsfolk also returning from Meet Your Baker include Lance, Thomas, Police Chief Doug (aka The Professor), and Richard Lord. In addition to the mystery of who killed Chef Marco, Jules is trying to figure out two other things. RE: Chef Marco, I was surprised by whodunit. I hadn't suspected him/her until Jules realized that he/she was the perp. Did you figure it out before we did? "My crime-solving days are behind me, Mom. Now it's going to be back to baking." Torte's brand-new catering business is successful — Lance is their first customer, and he loved everything Torte did for his end-of-theatre-season party — but it will still take a while to get the funds to upgrade the oven. The only thing I could compare the two men to was pastry. Thomas was like a soft oatmeal cookie, served warm from the oven with a chewy center. Carlos was like cherries jubilee, flaming hot on the outside. Once the flame burned out, what was left? I really enjoyed A Batter of Life and Death and highly recommend it to all Cozy Mystery fans, especially to fans of the Culinary sub-genre. If you're new to Cozies, this would be a great introduction to the genre. Note: I received a complimentary copy of A Batter of Life and Death in exchange for my honest review. to a randomly drawn winner (US) via rafflecopter during the tour.